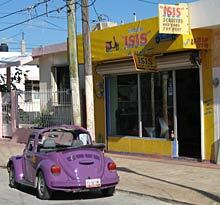 There are a wide variety of shopping in Cozumel, from upscale jewelry stores to funky flea markets. Cozumel shopping can even take place on the road that goes around the island. Here you will find tiny shops offering blankets and souvenirs. The following is a BRIEF listing of some of the shops in town. These are in no particular order. This is an interior view of "San Francisco." 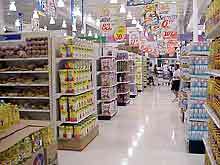 This is a large store that is like a combination of Wal-Mart and supermarket. A good place to stock up at the beginning of your stay. The store sells beer, wine, and liquor. Air conditioned and they take credit cards! Located at the corner of Avenida 30 and Calle 2. You can walk from our houses (you need to be in the mood for a stroll), but take a taxi the first time because you'll be carrying a lot back. This is an exterior view of "Chedraui." 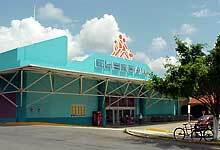 This is also a large store that is a combination of Wal-Mart and supermarket. Bigger than the San Francisco store, and slightly better prices. It's a good place to stock up at the beginning of your stay. The store also sells beer, wine, and liquor. Air conditioned and they take credit cards	. Located at the south end of town near the waterfront. Take a taxi - it's too far to walk. This is an interior view of "Mega." 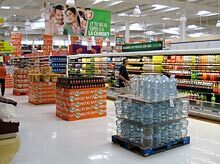 This is another large store that is a combination of Wal-Mart and supermarket. Bigger than the San Francisco store, and simlar to Chedraui. It's a good place to stock up at the beginning of your stay. 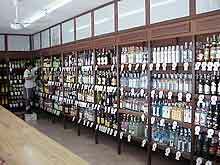 The store also sells beer, wine, and liquor. Air conditioned and they take credit cards. Located at the south end of town near the waterfront, about a block and a half closer than Chedraui. It's walkable, but you may want to take a taxi back. More of a traditional Mexican market. It's a covered structure that has several open doorways into it. The inside is a collection of booths and display areas that are individually owned and operated. This is where the locals shop for fruit, vegetables, meat, seafood, spices, household supplies, school supplies, and a little bit of everything. There are several tiny restaurants and lunch counters in here. Not air conditioned. Bring cash, preferably pesos. Located at the corner of Avenida (Avenue) 25 and Rosada Salas. This is one of the best places to buy your tequila, rum, kaluha, etc. This is where many of the locals shop. It is far away from the tourist shops in town so the prices are WAY lower. For example, the prices for my favorite tequilas are literally half what they cost at Cinco Soles on the waterfront in town. There's not much to the browsing here - it's a small store with maybe 3 aisles of assorted liquor and wine. Located at the corner of Avenida 30 and Calle 2, on the other side of Calle 2 from San Francisco. Probably the best shop in town for "Mexican Stuff." Yes, it's probably a little more expensive, but it has some of everything that every other shop in town has, plus some things that the others don't, and all at top quality. And fully air-conditioned, which you'll come to appreciate. You reach "Pancho's Backyard" restaurant by going through Cinco Soles. Located on the waterfront at the corner of Calle 8. The closest car and scooter rentals to our houses. Not a big operation, but friendly and reasonable. They have Volkswagen bugs, both hard-tops and convertibles. They have a few air-conditioned small cars. When you're finished with your vehicle, you can turn it in and walk back to the house in 5 minutes. Located on 5th Ave., between Calle 2 and Calle 4.